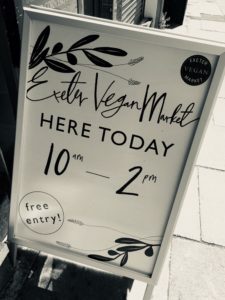 It’s great news that we now have a monthly vegan market in Exeter so of course I was there on Saturday. There’s nothing like surrounding yourself with lots of other people who have chosen a cruelty free compassionate vegan lifestyle. We arrived at Exeter Corn Exchange about midday……waaaaaaay to late for quite a lot of the cake! The vegan doughnuts were the biggest hit apparently and completely sold out in just one hour. 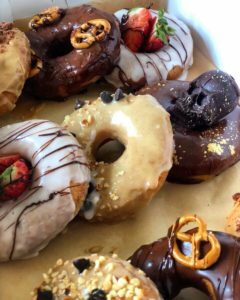 And here’s what everyone got excited about (below) the prettiest vegan donuts ever from The Marble Kitchen. We’ll make sure we get there early next time. So what else was there – well the fabulous Devon and Somerset vegan caterers Fairfoods of course and we had lunch from Clare, Paul and the gang – Vegan Mac Cheese & salad. 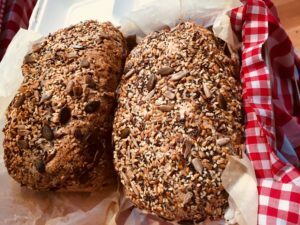 Another favourite we saw there is Naturally Bread who sells amazing vegan bread and cake outside Primark in the Guildhall. 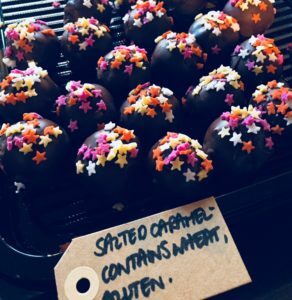 And how pretty are these cake pop choccies (below) from Little Wing Treats. I am definitely trying some of these next time!!! Nature’s Treats were selling a very eye catching range of handcrafted cakes like this one below plus truffles, sweets, treats and desserts. They don’t use palm oil or refined sugar and all their products are vegan. 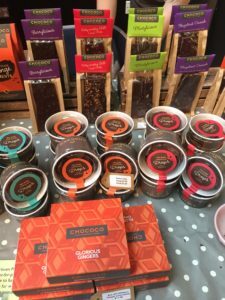 And chic local chocolate makers Chococo had a very colourful stall featuring all the vegan dairy free choccies from their lovely shop and cafe over on Gandy Street. 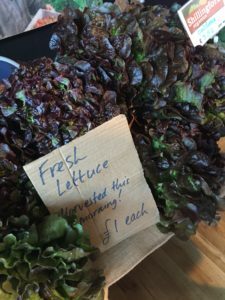 Amongst all the chocolate were a few gorgeous veggies grown by local Devon farm Shillingford Organics. 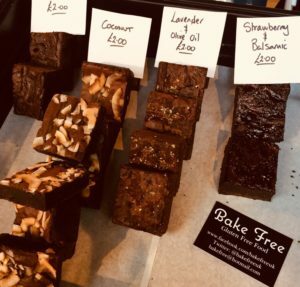 Plus Bake Free had a lovely stall of vegan gluten free food including these sweet treats below. I’ve heard a rumour that they do rather good chocolate and peanut butter brownies which I’d love to try! Here’s the dates for the next Vegan Markets in Exeter in 2018. 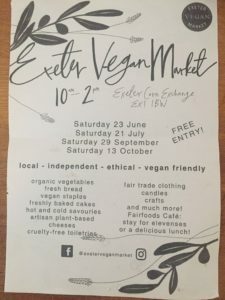 It’s free to get in and wonderful to know that the people organising it are a not-for-profit group including Sweet Vegan Cakes, Fairfoods and Exeter Friends for Animals (EFFA). All profits support EFFA’s campaigns against animal abuse and to promote cruelty-free living. 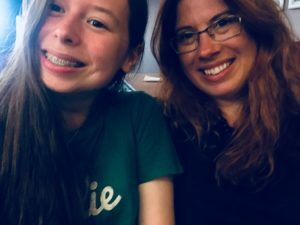 And this is me and (my daughter) Tasha below looking very happy at the market surrounded by fellow plant munchers! If you’re looking for more money saving and cash creating ideas – please join the friendly Super Savvy Vegan Facebook group. I’m also on twitter and Instagram. 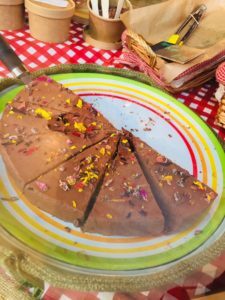 If you’re specifically looking for more vegan stuff in Exeter, check out my Gullivers vegan chocolate cake review plus The Flat Pizzeria and don’t miss Exeter’s Vegan Chip Shop! And please do get in touch if you’d like me to review your vegan goodies on here. Previous post: Calling all students – here’s some fab discounts!